The Asian Graduate Student Fellowship is a 4-week program where graduate students from Asian countries and selected American universities working on Social Science and Humanities topics take up residence on the NUS campus. At the end of the four weeks, fellows are asked to present a paper on their topics during the Singapore Graduate Forum on Southeast Asia Studies. My paper, titled ‘Coffee or Kopi: Placemaking in Urban and Traditional Coffeehouses of Penang, Malaysia’ was presented under the Heritage panel together with two other presenters from Taiwan and the United States. 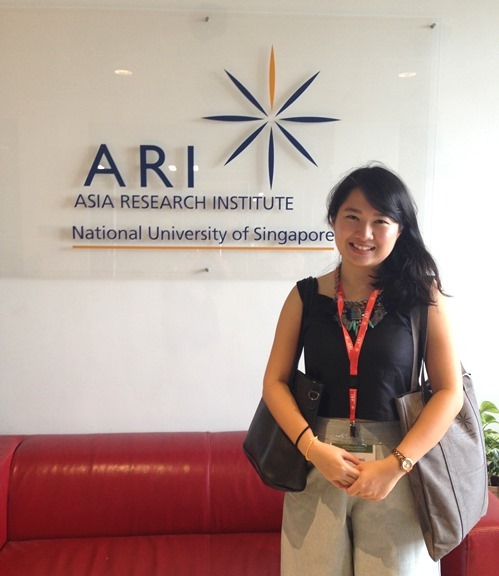 This fellowship gave me the opportunity to experience the NUS campus and its facilities. My access to all the university’s libraries, including the Institute of Southeast Asian Studies (ISEAS) and the Yale-NUS Library was particularly useful and allowed me to carry my literature research in different environments. Each fellow was assigned to a mentor and a visiting scholar who gave feedback and suggestions on our respective researches. I was assigned to a postdoctoral fellow, Dr. Creighton Connolly who specialises in environmental issues of Penang and Prof. Pheng Cheah, a distinguished literature scholar. My interaction with them were insightful as they gave me new ideas and perspectives to pursue in my doctoral dissertation. The friendships forged and contacts made during the fellowship and the forum are invaluable and could lead to future collaborations. As the fellowship was a month long, I also had time to explore Singapore like I never would have if I were there on a holiday with my newly made friends. At the end of the forum, we were treated to a tour of the Singapore Maritime Trail. Overall, the fellowship was a great balance of work and play as I learnt from the experiences of other scholars while also had fun in between. Although this fellowship was funded by the National University of Singapore, I also used my one-time Graduate Research Travel Subsidy of RM3000 from Monash University Malaysia which helped ease my travel expenses.